Jean-Francois Millet (1814-75) was a French artist born and raised in a Normandy farm family. He was educated in Latin and became familiar with modern-day writers, under the guidance of the two village priests, before moving to Cherbourg at the age of 19 to study under Paul Dumouchel, a local portrait painter. Within two years, Millet became a full-time student of artist, Lucien-Théophile Langlois, who was a one-time student of Baron Antoine-Jean Gros, a well-known French Neoclassical painter. By 1837 Millet moved to Paris where he studied under Paul Delaroche, thanks to the financial support he received from Langlois. His first submission to the Paris Salon, in 1839, was rejected, and his financial scholarship was subsequently cut off. The Salon later accepted his first painting, a portrait, the following year. At this time, Millet returned to Cherbourg and began his career as a promising portrait painter. Between the years of 1830-1870, a substantial group of like-minded artists began painting in and around the Fontainebleau Forest, located some 60 km southeast of Paris. Many settled in the village of Barbizon and were responsible for creating what became known as the Barbizon School. Leaders of the school included Jean-Francois Millet, Charles Daubigny and Theodore Rousseau. Arising during the Romantic Movement, Barbizon artists leaned more toward Realism, causing them to leave behind the formalism so prevalent at the time, instead making nature and country landscapes the central themes of their works. Millet went on to include figures in his landscapes and is best known for his many pieces depicting rural themes of peasant farmers in the course of their daily activities. Although rejected by the Paris Salon several times and often ridiculed by critics and the public alike, Millet was contracted to produce many works for both the government and for private benefactors. There is no question that he influenced and encouraged such artists as Boudin, Monet and Pissarro, as well as many painters who came to live and work in the village of Barbizon - where Millet eventually died and was laid to rest. Here at Affordable Art 101, we've put together a great selection of fine etchings made after Millet paintings. Included are two examples of "La cueillette des Haricots," etched by Edmond Hédouin and published in 1875. Example number one, the rarer of the two, is printed on japon paper and has been tipped by the publisher onto a support sheet of Bristol board. The second example of "La cueillette des Haricots," from the final published edition, is printed on watermarked laid paper. Both etchings measure 8" X 6.5". 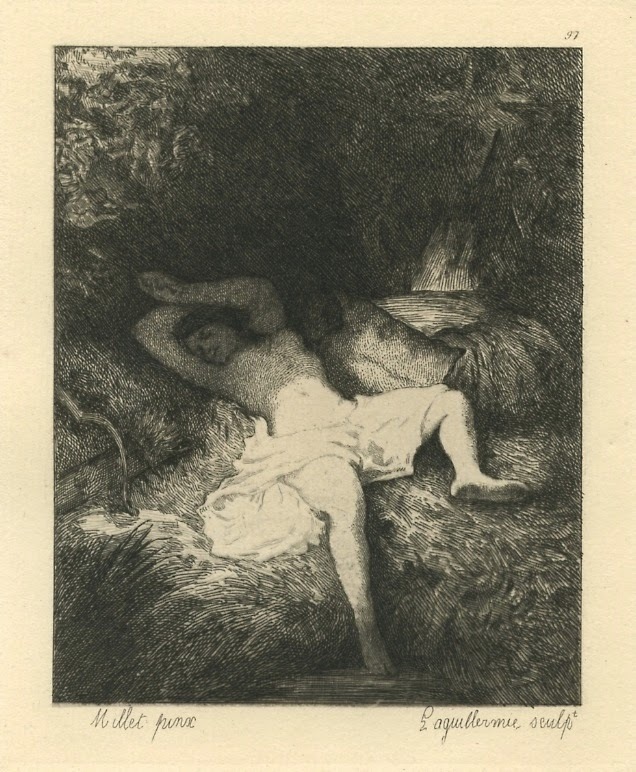 Two pieces, etched after figurative paintings made by Millet, are both entitled "Femme Couchee," which translates from the French as “Woman Reclining”. The first is etched by Frenchman, Frédéric Auguste La Guillermie and published in 1873 in Paris. It’s on cream laid paper with the plate measuring 6" X 5". It features a platemark and is plate-signed. 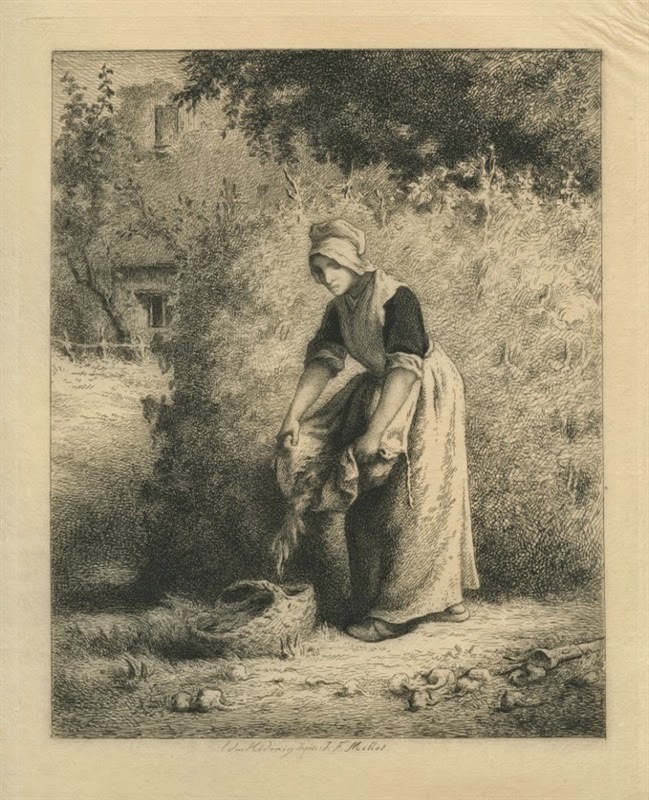 The second "Femme Couchee" etching was made by Charles Courtry and also published in Paris in 1873. The plate measures 4 1/2" X 6 3/8" and is printed on cream laid paper. It's in good condition, featuring good margins and a platemark. Although the term "Abstract Expressionism" is believed to have been first used in a 1919 issue of the German magazine, Der Sturm, and later used in 1926 by Alfred H. Barr, Jr. to describe the works of Wassily Kandinsky, the actual Abstract Expressionism Art Movement is generally accepted as beginning in 1946, just after the end of World War II. Barr, an influential art historian of the day and first director of New York City's Museum of Modern Art, witnessed Abstract Expressionism as it became the first American Art Movement to attain genuine international acclaim. Robert Coates, American writer and long-time art critic for The New Yorker magazine, officially coined the phrase in 1946 when referring to works of Jackson Pollock, Arshile Gorky and Willem de Kooning. Abstract Expressionism, centered on a number of artists with a loose affiliation working in New York City, is sometimes called the New York School and, alternatively, Action Painting or Abstract Kinetic Art. It resisted being defined as a specific style, breaking away from previous European painting traditions. As a result, and for the first time ever, the primary focus of the international art world transferred from Paris to New York. Works created within this movement were known for their large-scale, monumental size, where spontaneity and improvisation were most important and imagery was abstractly applied - even when based upon visual reality. The idea was to convey strong, emotional and highly expressive content. Canvasses were sometimes removed from the easel, placed on the floor and painted on quickly and forcefully. Sometimes paint was simply dripped or thrown at the canvas, as a means of showing strong feelings and emotions. It was believed that this type of painting would release an artist's inner creativity and unconscious mind. 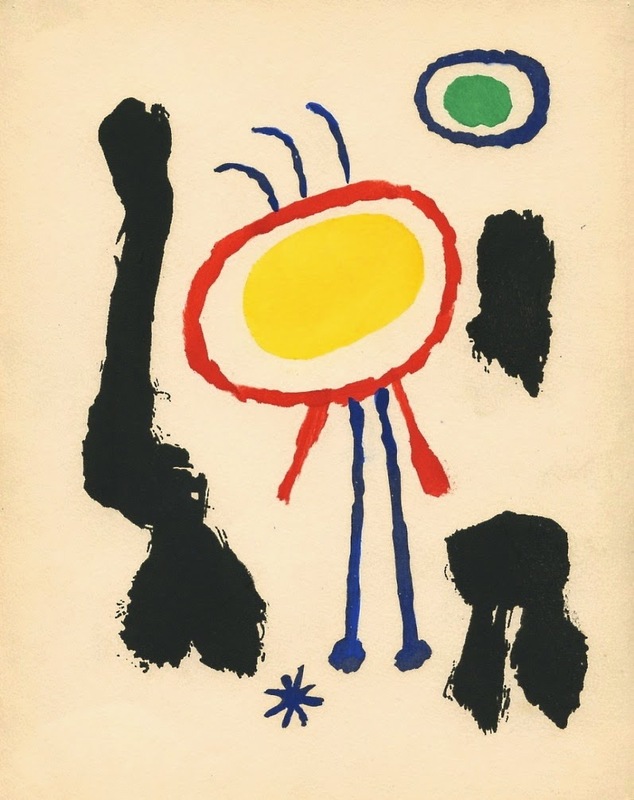 Joan Miro (1893-1983), a Catalan artist who enjoyed a long, fruitful career, was quite active during the Abstract Expressionism Movement. After dabbling in the 1920s with early surrealism and as one of the first artists to experiment with automatic drawing, he had already experimented with the expression of the artist's subconscious mind – which later became a common method in later Abstract Expressionism. 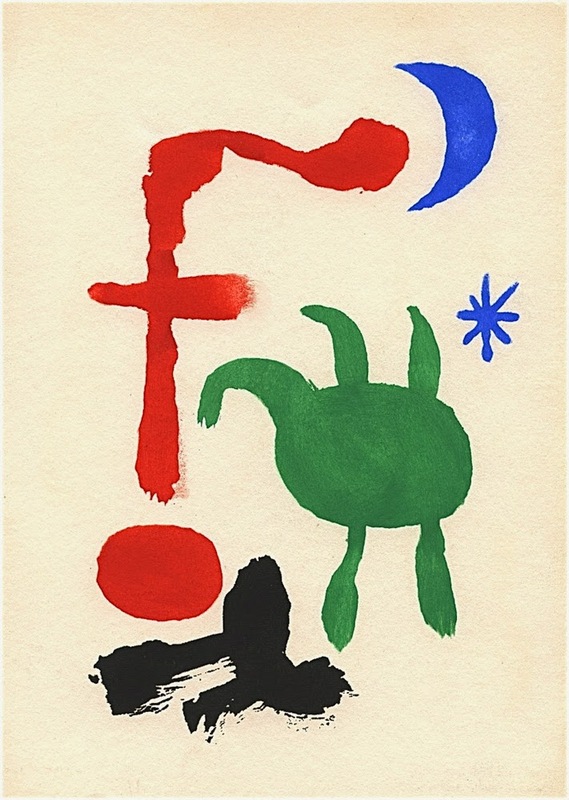 Two of Miro's original pochoir stencil prints, both from 1947, can be found here – "Women and Birds before the Moon" (in five colors) and "Woman and Birds in the Night" (in four colors). Both are printed on cream wove paper and are authenticated by the publisher's inscription, located on the reverse side of the sheet. 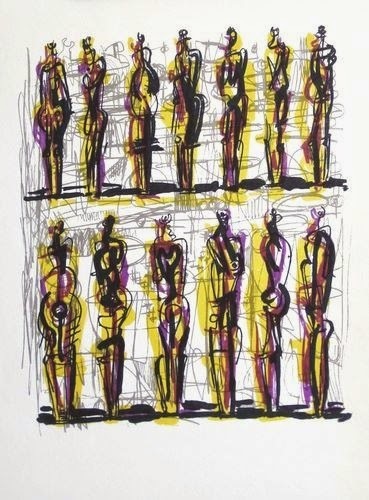 Another wonderful example of Abstract Expressionism is the 1958 print "Thirteen Standing Figures" by Henry Moore. This original color lithograph is on handmade wove paper and bears Moore's official watermark.